I could have titled this post “What To Do With Box-Ripened Tomatoes.” Fall presents gardeners with something of a quandary: what to do with all the green fruit that had to be gathered before the first frost. By this time, most of us in the parts of the country that experience winter have picked our green tomatoes. We’ve boxed them, and we’ve probably mostly dealt with them. A couple of weeks ago, I wrote about what I did with my green tomatoes this year. But there are always some we let ripen in the box. 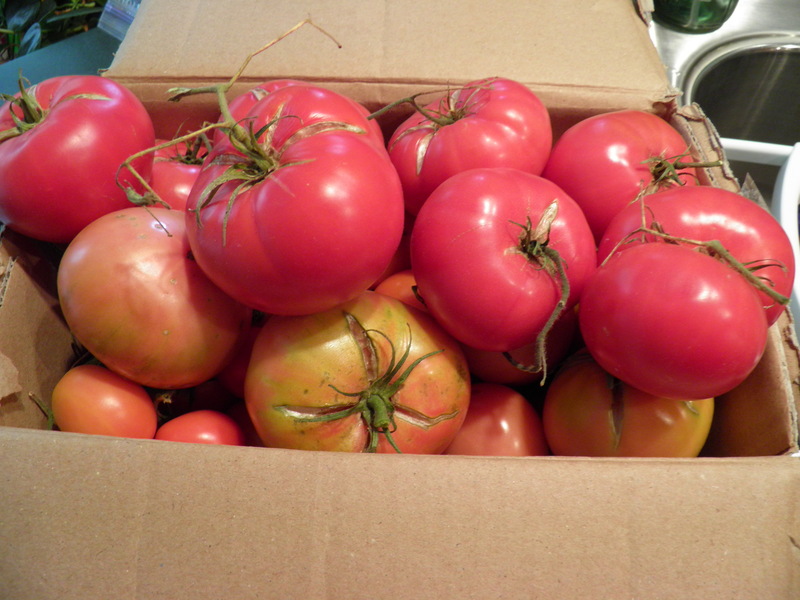 The first few box-ripened tomatoes are good. They were the ones so close to ripening on the plants that only a few days or a week or so in the box with other tomatoes, and maybe an apple or banana or two, have brought them good flavor and juice. They’re fine for eating fresh, in salads, on sandwiches and hamburgers. But as the days go by, and as the tomatoes that were truly green when picked start to ripen under the influence of the ethylene they (and the banana and/or apple) produce, the flavor starts to decline. 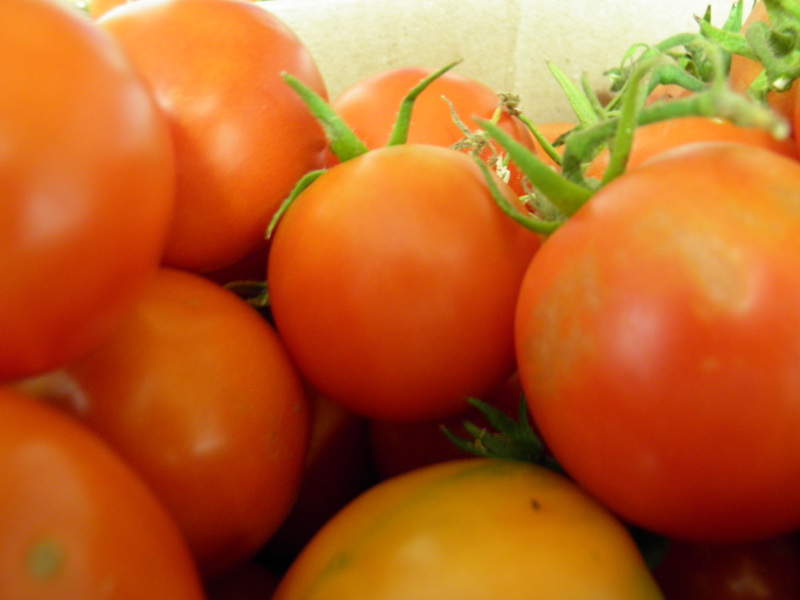 After a few weeks, the tomatoes that ripen don’t have much more flavor or juice than supermarket tomatoes. And we all know what those taste like. So what do we do with these tomatoes we saved and cared for and now don’t really want to eat? I make sauce. I make two sauces, and the recipe I choose depends on how many tomatoes I have, which of my two sauces I have left from last year, and what I think I’ll need in the year ahead. One of the sauces is an all-around pasta/pizza sauce, and I usually freeze it because it doesn’t make much (tomatoes really cook down), and I’m tired of canning by November. The other is red hot sauce, which could be frozen, I suppose, but is designed to be canned. I discovered red hot sauce a couple of years ago when my husband was given a whole, uprooted bush of habaneros to bring home to me. This was a dubious gift—something the giver really just wanted off his hands so he didn’t have to deal with them. What in the heck was I going to do with approximately 40 habaneros? I started paging through my trusty Ball Blue Book and found red hot sauce. It didn’t call for habaneros, but it called for hot peppers and tomatoes, both of which I had in abundance. Never mind that the peppers were supposed to be “long, hot red peppers” and the tomatoes were supposed to be “red-ripe.” Mine were red. Sort of. They’d been in the box long enough to ripen. Sort of. Good enough. I made the hot sauce with habaneros and my box-ripened tomatoes. I learned a little something about working with hot peppers along the way. Yes, I knew that habaneros were about the hottest pepper I would likely ever encounter. I knew to wear gloves and keep my hands away from my face. What I didn’t know was that chopping the peppers in the food processor was a no-no. What I didn’t know was that as soon as I took off the lid, the capsaicin that had been released from chopping the habaneros would rise up and hit me in the face like pepper spray out of a can. Since I’d never been hit in the face with pepper spray, I didn’t know that it made you cough, and cough, and wheeze for breath, fruitlessly. I’d heard about the tears, the outpouring of snot from abused mucus membranes, but I’d never experienced them. It was an hour before I could go back in the kitchen and continue my little experiment. But I am nothing if not dogged. It was still pretty fumey in there, and for the rest of the time I worked with the sauce, I coughed and wheezed and hacked and went through a box of tissues. But I learned that vinegar neutralizes capsaicin, and as soon as I got the vinegar, tomatoes, and peppers all cooking together, the peppers stopped releasing capsaicin, and I started feeling a whole lot better. I got the food processor and all the tools I’d used on the peppers rinsed out with COLD water, and then washed with dish soap, and the atmosphere in the kitchen improved considerably. The red hot sauce turned out beautifully. I was afraid to taste it, at first. But having made it, I had to see if it was edible. There was still heat, but no burn. The vinegar tames the burn. It was slightly sweet and the spices made it somewhat reminiscent of ketchup. But it was nothing like ketchup. I ended up with 3 half-pint jars. I gave two of these to my son, who loves spicy. He was the one who discovered that a better dipping sauce for a shrimp platter has yet to be found. And that’s why this year, I once again made red hot sauce with my box-ripened tomatoes. I’m envisioning shrimp platters at football parties. For the timid tasters among us, I’ll also make a lemon-basil mayonnaise. But back to the red hot sauce. Like pizza/pasta sauce that gets a lot of flavor from wine, herbs, onions, and garlic, red hot sauce is a perfect way of using up those box-ripened, less-than-tasty tomatoes because you’ll add a lot of flavor with the peppers, vinegar, salt, sugar, and spices. 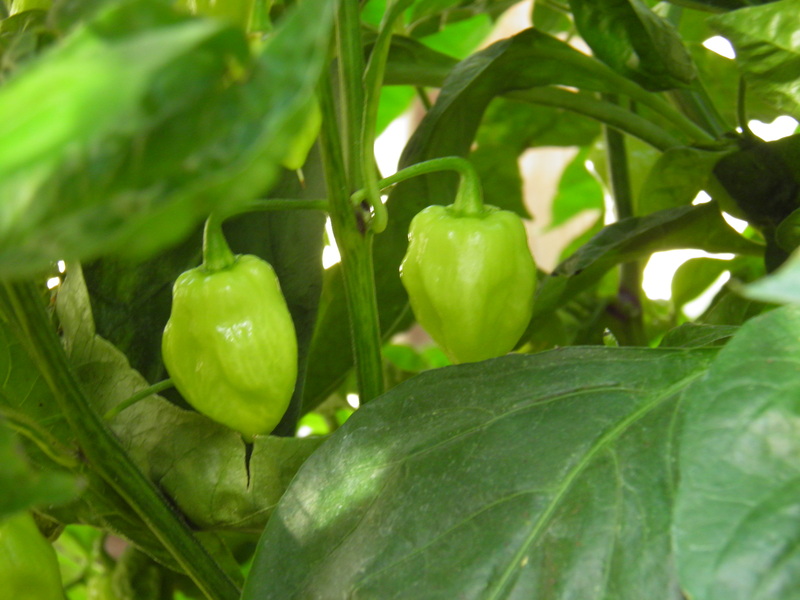 This year, with red hot sauce in mind, I actually planted habaneros in my greenhouse. I started them from seed in April. I should have started them in early March. They are very slow to sprout and then to grow. They didn’t even start blooming until August, so I knew that it was unlikely I would get ripe peppers. When my boxed green tomatoes started to get ripe, I checked my habaneros. There were some small green peppers just starting to turn yellowish. Good enough, I decided. I gathered them. I also had some jalapenos that I’d gathered from the garden when I picked all the green tomatoes. And I had a few store-bought Serrano peppers, smaller but hotter than jalapenos. I needed 1 ½ cups of peppers, chopped. But wait a minute. It was the chopping that got me into trouble before. And it was the vinegar that came to my rescue. So I devised a plan to keep that capsaicin under control. What follows is the recipe I used, unaltered from its 1981 Ball Blue Book roots, except for the preparation of the peppers and the cooking time. Add the peppers and vinegar to the tomatoes and vinegar and cook until tomatoes are soft. Wearing gloves, run the mixture through a food mill, fine-mesh strainer, or chinois to remove skins and seeds. Put the resulting juice and pulp back into the pot and add the sugar and salt. Put the pickling spices in a spice bag or tie in a square of cheesecloth or nylon tulle and immerse in tomato mixture. Cook, stirring frequently, until thick. Add remaining 2 cups of vinegar. This will thin down the sauce again. Continue cooking until as thick as desired. (For shrimp dipping sauce, the right consistency is like a thin, pourable ketchup. It should be thick enough to adhere to the shrimp when dipped, but not so thick that it all comes away on the first shrimp dipped.) Remove spice bag. Pour into sterilized, half-pint jars, leaving ¼ inch head space. Process for 15 minutes in boiling water bath, adjusting for altitude as necessary. 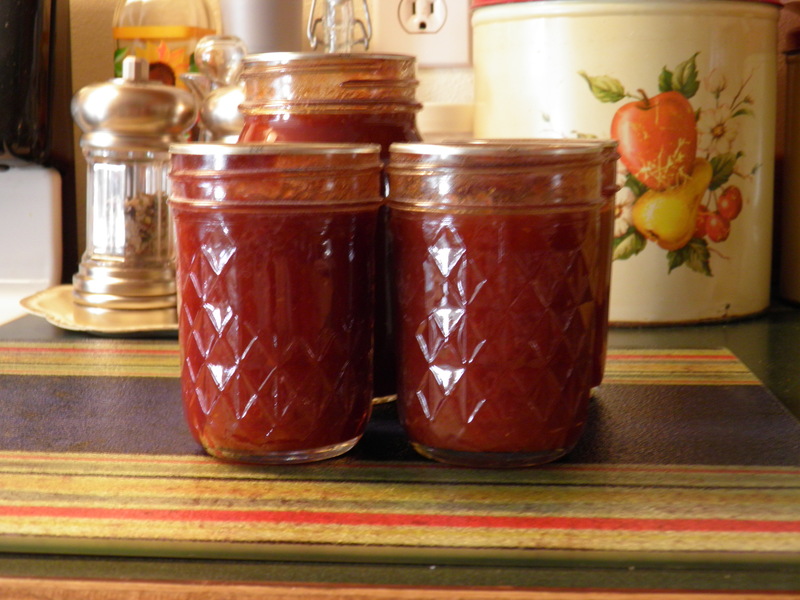 Yield is about 4 half-pints, but it depends on how much you reduce the sauce before putting it in the jars. Some notes: It takes a while thicken the tomato sauce. You can’t turn it up high or it sticks, so it has to be simmered on low, and it can take a couple of hours. Have something else to do in the kitchen while you’re making this sauce. You need to be available to stir it so it doesn’t stick, but other than that, it doesn’t require any attention. And then as soon as you get it thick, you add more vinegar and thin it down again, and you have to cook it down again. But, NEVER skimp on the vinegar. I know it’s a lot of vinegar, but the peppers need it, and the sauce needs it to have enough acid to make it water-bath safe. Also, do add it as directed at two different times in the cooking process. There’s a reason for this. Boiling a vinegar solution can evaporate the vinegar’s acetic acid. And its acid is the reason we use the vinegar. Adding vinegar at the beginning of the cooking time tames the peppers, but some of the acid cooks out. Adding more vinegar closer to the end of the cooking time ensures the sauce’s acidity. Trust me, the sauce isn’t vinegary. It’s actually perfectly balanced between heat, sweet, acid, and spice. Also never increase the amount of peppers in the recipe to get more heat. That affects the acid balance and can create opportunities for botulism to grow. Habaneros are plenty hot enough in this sauce, believe me. And if you want less heat, seed your peppers. Or use jalapenos. Or use Serranos for slightly more heat. Or mix the two. Or mix it up with a variety of peppers, like I did. Just don’t exceed the AMOUNT called for in the recipe. That’s it. That’s a good way of using up your box-ripened tomatoes. That’s perfect dipping sauce for a shrimp platter at your Super Bowl party. That’s red hot sauce. All photographs are the intellectual property of the author, are copyrighted, and may not be copied, reproduced, or used in any way without the author’s permission.